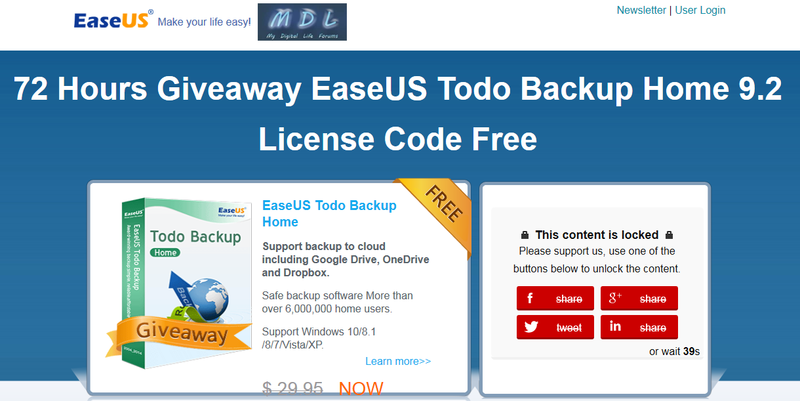 72 Hours Giveaway EaseUS Todo Backup Home 9.2 License Code Free. Discussion in 'Giveaways and Contests' started by sid_16, Jan 12, 2017. First we would like to thank EaseUs for giving our forum members and guests the opportunity to get the EaseUS Todo Backup Home 9.2 free for 72 hours. To get a free copy of EaseUs Todo Backup Home 9.2 , visit the Giveaway page bellow then share the Giveaway at any social media site as shown in the picture or wait for sometime to see the download link and Key Code.